A flatbed photo scanner connected to a traditional computer is generally the preferred way of creating digital copies of printed photos. While this method is still popular with those who want the highest quality and precise reproduction/archiving, mobile devices have broadened the scope of digital photography. 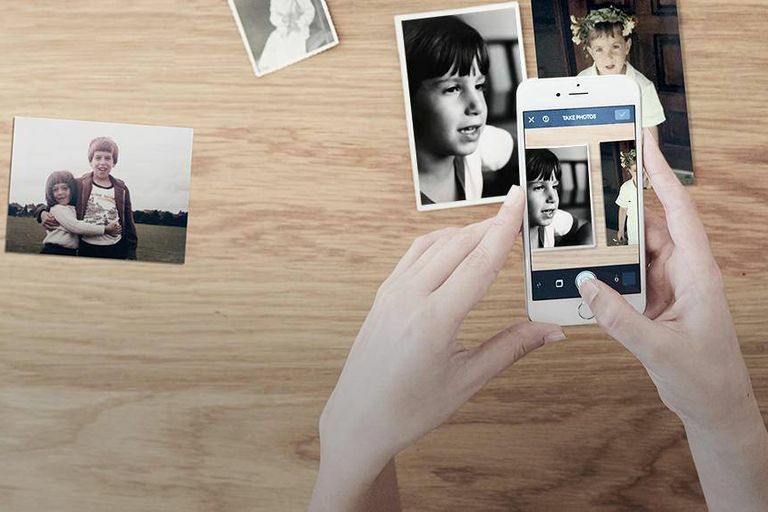 Not only are smartphones capable of taking fantastic pictures, but they can scan and save old photos too. All you need is a good photo scanner app. Each of the following (listed in no particular order) have unique and useful aspects to help you scan photos using a smartphone/tablet. Does one thing, but does it well. Stores your scans in Google Photos. Deep link into Google services — offputting for people who value their privacy. Just a scanner; no meaningful in-app editing tools. If you like fast and easy, Google PhotoScan will suit your photo digitizing needs. The interface is simple and to-the-point – all PhotoScan does is scan photos, but in a way that virtually avoids the dreaded glare. The app prompts you to position a photo within the frame before pressing the shutter button. When the four white dots appear, your job is to move the smartphone so that the center reticle aligns with each dot, one by one. PhotoScan takes the five snapshots and stitches them together, thereby correcting perspective and eliminating glare. All in all, it takes around 25 seconds to scan one photo – 15 for aiming the camera and 10 for PhotoScan to processing. Versus many other apps, PhotoScan’s results maintain much better quality/sharpness despite the tendency to come out slightly more exposed. You can view each scanned photo, adjust corners, rotate, and delete as necessary. When ready, one press of a button batch-saves all the scanned photos to your device. The app doesn't seem to be a focus of the developer, so it's not clear how long it'll be maintained. Found a box of old film negatives? If so, Helmut Film Scanner can help you convert those physical rolls/slides into digitized photos without any specialized hardware. The app steps you through the process of capturing, cropping, enhancing (i.e. brightness, contrast, levels, color balance, hue, saturation, lightness, unsharp mask), and saving/sharing photos created from negatives. It works with black and white negatives, color negatives, and even color positives. For best results with Helmut Film Scanner, one just needs to ensure a bright, uniformly-lit light source. This can mean using a film lightbox, or sunlight streaming through a glass window. One could set negatives against a laptop screen (max brightness) with an empty Notepad window open. Or one could use a smartphone/tablet with a lightbox app or plain white screen (also max brightness) showing. Any of these methods will help retain the best color accuracy when scanning film. Clean app that supports several photos in one scan. Great tools for saving your scans. Quality of the scanned images isn't as solid as with other apps. One of the benefits to using a flatbed scanner (with capable software) is the ability to scan multiple photos at once. Photomyne does the same, making quick work of scanning and identifying separate images in each shot. This app can be an ideal time-saver when attempting to digitize images found in albums containing numerous pages filled with physical photos. Photomyne excels at automatically detecting edges, cropping, and rotating photos – you can still go in and make manual adjustments if desired. There’s also the option to include names, dates, locations, and descriptions on photos. The overall color accuracy is good, although other apps do a better job at minimizing the amount of noise/grain. Photomyne limits the number of free albums for non-subscribing users, but you can easily export (e.g. Google Drive, Dropbox, Box, etc.) all digitized photos for safekeeping. App has value beyond just photo scanning. Free and tied to Microsoft services. Works fast, with a few basic edit tools. App not optimized for photo scanning. App's potential shines brightest when part of a full Microsoft application stack. If high-resolution photo scans are the main priority, and if you have a steady hand, flat surface, and ample lighting, Microsoft’s Office Lens app is choice. Although the description touts keywords of productivity, documents, and business, the app does have a photo-capture mode that doesn’t apply enhanced saturation and contrast (these are ideal for recognizing text within documents). But most importantly, Office Lens lets you choose the camera’s scanning resolution – a feature omitted by other scanning apps – all the way to the maximum your device is capable of. Office Lens is simple and straightforward; there’s minimal settings to adjust and only manual rotating/cropping to perform. However, scans done using Office Lens tend to be sharper, with image resolutions two to four times greater (based on the camera’s megapixels) than those by other apps. Although dependant on ambient lighting, the overall color accuracy is good – you can always use a separate photo-editing app to fine-tune and adjust photos scanned in by Office Lens.